Nothing of consequence because it’s coming off a model-year 2017 freshening. Those updates included revised styling, a revamped dashboard, and newly available safety and convenience features. The ’17 changes should sustain this subcompact crossover until its next full redesign, around model-year 2020 or ‘21. 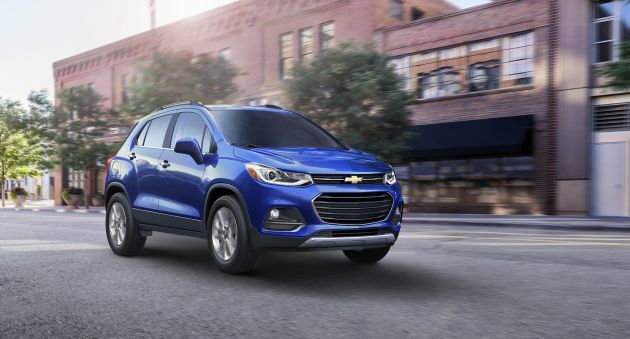 After several years on sale in other countries, Trax joined Chevy’s U.S. roster for model-year 2015 to compete in what’s become one of the world’s fastest growing market segments. Trax sales were up a healthy 25 percent in 2016, but even that growth paled against increases of 95 percent for the rival Honda HR-V and 75 percent for the Jeep Renegade. Other competitors include the Mazda CX-3 and Nissan Juke and the just-introduced 2017 Nissan Rogue Sport. Set to arrive for model-year 2018 are the Toyota C-HR and Ford EcoSport. Perhaps to judge it against the new Toyota and Ford rivals, which will feature more aggressive styling. Otherwise, the ’18 Trax won’t differ from the 2017 by any metric worth waiting for. It will almost certainly cost more thanks to model-year inflation. There might be a new color choice or two, but the ’18 Trax will otherwise carry over the changes that came on line for model-year ’17. The ’18 Trax will also maintain the basic design and mechanical features that date to this crossover’s 2015 U.S. debut. Aimed in large measure at young urban singles, it’s a four-door wagon that’s quite tall but not very long. Power comes from a small turbocharged four-cylinder engine and both front-wheel drive and all-wheel drive (AWD) are available. The 2017 updates didn’t change the essential shape of a body that furnishes unexpectedly roomy passenger space, or performance marked by surprisingly composed road manners. If you like Chevy’s tiny crossover, it’s probably a wiser choice than waiting for the ’18. It would give you an extra year before the styling and features are replaced in the next redesign. And you’d sidestep price increases for what will be essentially a carryover model. Even the ’17 lineup is expected to continue for model-year ’18. It’ll again begin with the base LS, continue through the volume-selling LT, and top out with the Premier. Trax also will remain the less-posh cousin of the Buick Encore, which shares its understructure but has different styling, a more luxurious interior, and offers both the Trax engine as well as a more powerful turbo-four. Only by virtue of a possible new color choice or two. The ’18 Trax will rerun the styling updates introduced with the model-year ’17 freshening. Leaving the main body untouched, Chevy revised the nose with a dual-port grille that strengthens brand identity. New headlights incorporated LED daytime running lamps for LT and Premier. The revamped rump included LED tailamps for those models, too. This is still a truncated form – in fact, the changes shortened overall length by 1.3 inches – but the latest Trax looks far less awkward than before. Visual differences between models will again run to things like roof rails and silver-painted faux skid plates for the LT and Premier, plus a bit of exclusive chrome trim for the Premier. Also unaltered will be wheels: 16-inch steel rims for the front-drive LS, 16-inch alloys for the AWD LS and the LT, and 18-inch alloys standard for the Premium and optional for the LT. Inside, upright seating will again collaborate with the tall roofline to fit four adults in reasonable comfort. Nothing feels cut-rate, and the ’18 will continue a dashboard updated for ’17 with available contrasting stitching and a new gauge display incorporating a digital-information display. Same for upholstery: basic cloth on LS, far more deluxe cloth for LT, and a convincingly upscale leatherette for Premier. The 2017 dashboard revisions eliminated a handy auxiliary glovebox. And most rivals will again beat the ’18 Trax for cargo volume, although the Chevy’s folding front passenger seatback lets you haul objects eight feet long. `No. The ’18 will use the only powertrain the U.S.-market Trax has known: a turbocharged 1.4-liter four-cylinder with 138 horsepower and 148 pound-feet of torque linked to a six-speed automatic transmission. At just over 9 seconds, 0-60 mph will again be on the slow end of the spectrum. Turbo lag causes momentary delay from a dead stop. But there’s good scoot after that, and you won’t lack confidence to pass slower traffic or merge onto a freeway. Highway cruising is stable and a high seating position and good outward visibility invite you to exploit this tiny SUV’s impressive low-speed maneuverability. By contrast, fast cornering triggers lots of body lean and noseplow. The Premier’s 18-inch tires contribute to slightly better grip and response, but they don’t absorb bumps nearly as well as the other models’ 16s. Every Trax suffers some choppiness on broken pavement, but the LS and LT ride more comfortably than most vehicles this size, no matter the category. The 2018 Jeep Renegade and Subaru Crosstrek should remain the segment’s only entries that welcome off-pavement excursions. At 6.2 inches, Trax’s ground clearance is about an inch higher than that of a car. And like most of its ilk, the AWD system is designed as a traction enhancer in snow or on gravelly surfaces. It’s a very basic system – automatically shuffling power from the front wheels to the rears to quell tire slip – but one we recommend to get the most out of this crossover. With no mechanical changes, EPA ratings for the 2018 Trax should be unchanged. That would leave it about midpack in the segment, but still quite good overall for a vehicle with its degree of utility. Expect the ’18 Trax to rate 25/33/28 mpg city/highway/combined with front-drive and 24/30/27 with AWD. It’ll again be tuned to run on regular-grade, 87-octane gas. Very unlikely, although the addition of autonomous emergency braking would bring it closer to the class leaders for safety. As it is, the 2017 refresh brought some notable new safety features that will continue for ’18. These include blind-spot and rear cross-traffic detection, which are likely to remain standard for the Premier, optional for the LT, and unavailable on the LS. The Premier should also be available with forward-collision alert and lane-departure warning. All models will again come standard with a rearview camera and 10 airbags, including rear torso-protecting bags – very rare for any vehicle in this price range. Trax, along with the Encore, has scored well in crash tests that measure passive-safety performance. But absent any sort of automatic braking system designed to mitigate a frontal collision, it has not been eligible for top ratings from the influential Insurance Institute for Highway Safety (IIHS). Among subcompact crossovers, only the Mazda CX-3 earned the IIHS’s coveted Top Safety Pick+ rating for 2017, while the Fiat 500X merited the second-highest Top Safety Pick rating. Do expect the ’18 Trax to remain among the segment pacesetters for connectivity. 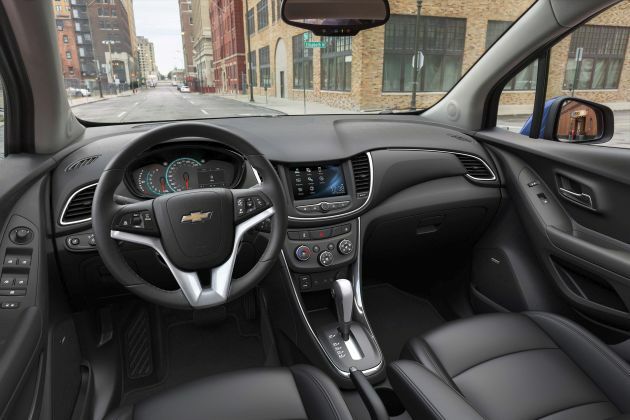 GM’s outstanding OnStar concierge service will again be standard, as will Chevy MyLink with available high speed 4G LTE service that turns the Trax into a mobile WiFi hot spot. All models will again have Android Auto and Apple CarPlay smartphone integration, a 7-inch dashboard touchscreen, and two USB ports. Returning as optional on LT and standard on Premium should be keyless entry with pushbutton start, a leather-wrapped steering wheel, and rear park-assist alerts. Expect them to increase slightly but to remain in the heart of the category. Estimated base prices here include Chevy’s destination fee, which was $895 for the 2017 Trax. As before, expect to add $1,500 to any ’18 model to upgrade from front-drive to AWD; about 50 percent of Trax buyers order it. Estimated base price for the 2018 Trax LS is $22,200. It should again come with basics like air conditioning, power windows, locks, and mirrors, plus a rigid removable cargo cover and a rear underfloor storage tray. Expect LS options to remain limited to items like all-weather floormats. Estimated base price for the 2018 Trax LT is $24,100. It should again build on the LS with standard features such as a driver’s power lumbar support, satellite radio, an under-front-passenger-seat storage drawer, heated body colored power mirrors, and the aforementioned headlamp and daytime running-light upgrades. Expect key options to again include $2,450 for Midnight Silver 18-inch alloy wheels, $1,400 for the Sun & Sound Package with a power sunroof and a Bose-brand seven-speaker audio system, and $495 for the Driver Confident Package with blind-spot and rear cross-traffic alerts and rear park assist. Estimated base price for the 2018 Trax Premier is $27,300. It should again include all the LT equipment, plus the Driver Confidence Package. Forward collision alert and lane-departure warning would again be included in an exclusive $295 Driver Confidence II Package, though we’d like to see Chevy make these driver aids available on the LT model, too. With the Bose audio system standard, a power sunroof would again be a $900 stand-alone Premier option. Exchanging the standard 18-inch alloys for Midnight Silvers would again cost $1,855. Release date for the 2018 Trax is in the second half of 2017. Ford EcoSport, Honda HR-V, Jeep Renegade, Mini Cooper Countryman, Mazda CX-3, Nissan Rogue Sport, Subaru Crosstrek, Toyota C-HR. The aforementioned safety-feature enhancements, and a more compliant ride with the show-off 18-inch wheels and tires. We could always wish for better handling and quicker acceleration, but those are not necessarily priorities to most of the audience Trax targets. Styling may be, however, an at least Chevy’s 2017 freshening helped Trax look less ungainly.